Reginald Arthur Elmes was born in the 4th quarter of 1890 in Shere, Surrey to coal merchant William and Ann Elizabeth (nee Edwards). 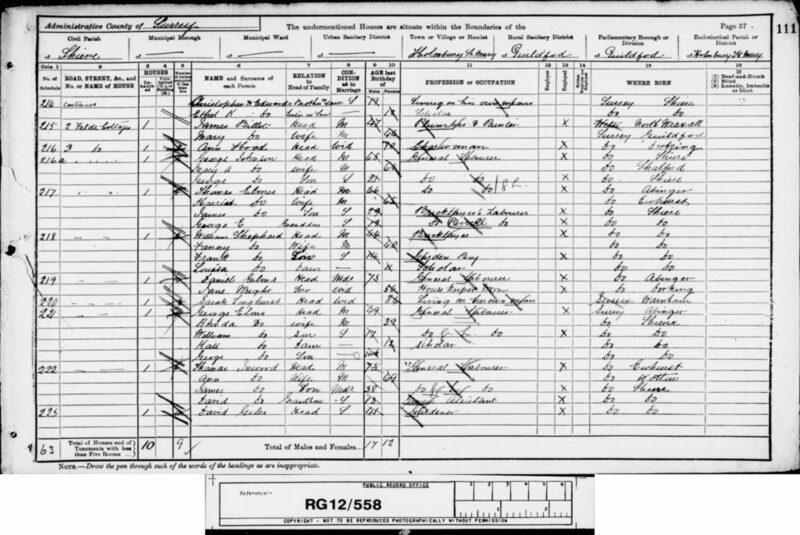 Reginald’s father William was born on the 1st of June 1858 in Ewhurst, Surrey to agricultural labourer Thomas, born about 1824 in Abinger, Surrey and Harriet, born about 1826 in Ewhurst. William was baptised on the 4th of July 1858 at St James’ Church in Abinger. 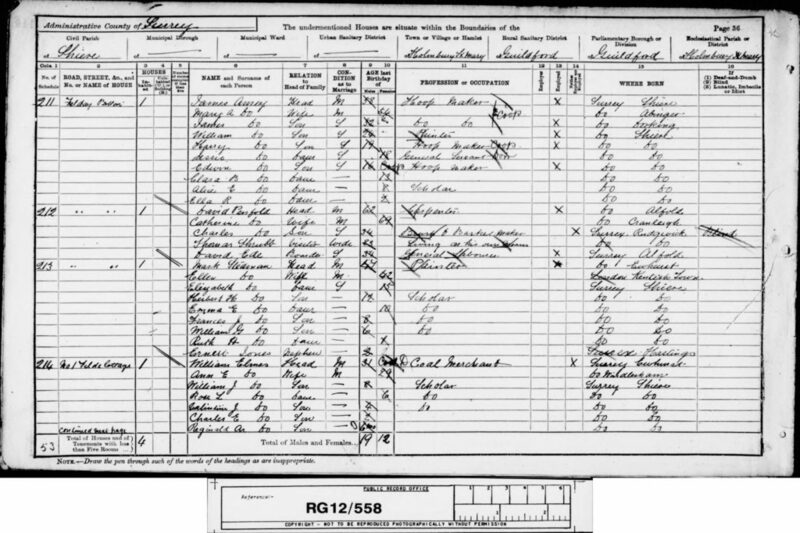 His mother Ann was born in the 2nd quarter of 1862 in Windlesham, Surrey to wheelwright John, born about 1839 in Shere and Priscilla, born about 1839 in Milton, Oxfordshire. William and Ann married in the 4th quarter of 1881 in Guildford, Surrey. Reginald had seven known siblings: William J born about 1883; Rose L. born about 1885; Valentine Jesse born about 1887; Charles E. born about 1889; Georgina Annie born about 1893, Alfred Henry born about 1895 and Daisy Cora born about 1899, all in Shere. At the time of the 1891 Census, the family lived at 1 Felde Cottages, Holmbury St Mary, Surrey. William was working as a coal merchant and Annie was looking after their children: William, Rose, Valentine, Charles and Reginald. The household further comprised of William’s brother in law Christopher and sister in law Ethel. Reginald’s father William died in the 4th quarter of 1900 in Guildford. 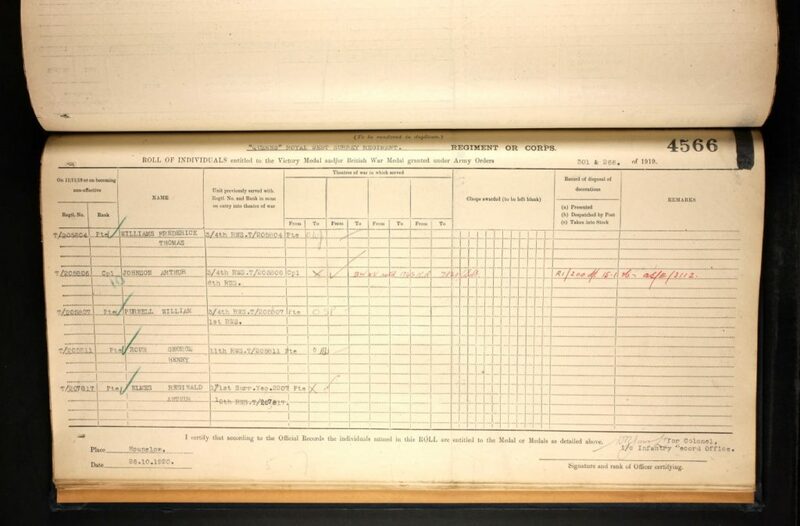 At the time of the 1901 Census, the family lived in Holmbury St Mary. Ann was at home looking after her children: Rose, grocers’ errand boy Valentine, Charles, Reginald, Georgina, Alfred and Daisy. The household further comprised of Ann’s brother Christopher and a boarder, plumber William Brazier and his family. 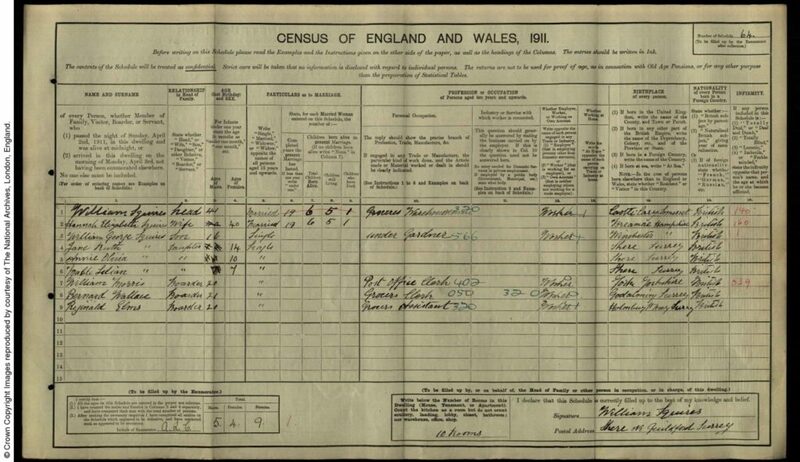 At the time of the 1911 Census, Reginald was a boarder of grocer’s warehouseman William Squires at Shere. Reginald was working as a grocer’s assistant. The house had ten rooms. 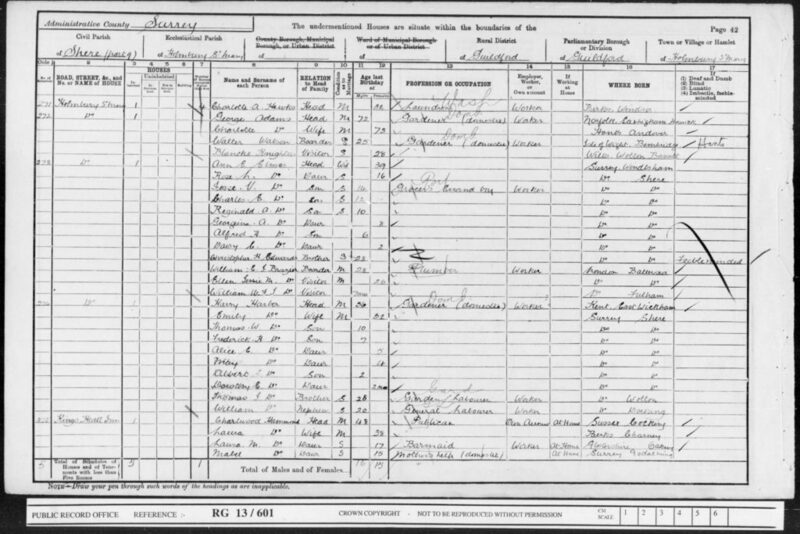 At the time of the 1911 Census, Reginald’s mother Ann lived in Holmbury St. The household further comprised of her children: Georgina, Daisy and grocer’s assistant Alfred and Ann’s brother Christopher. Ann stated that she had given birth to ten children of whom eight were still alive. The accommodation had four rooms. 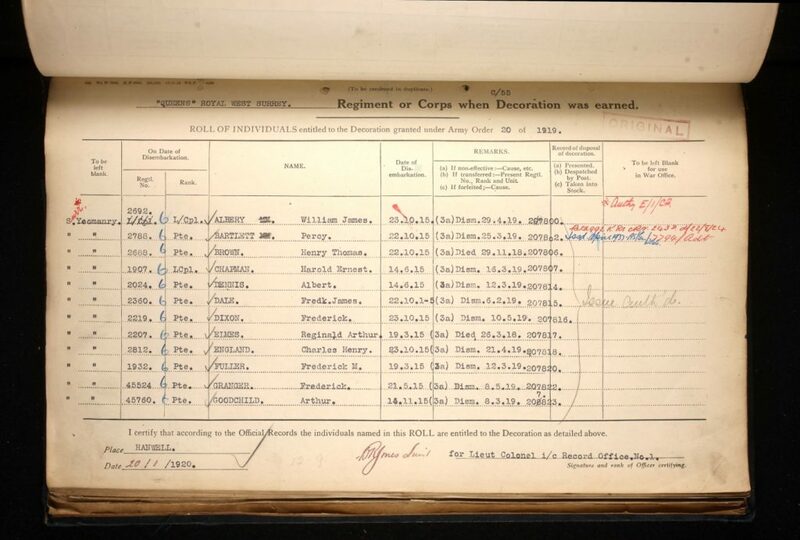 Reginald Elmes enlisted in October 1914 in Dorking into the 1/1st Surrey Yeomanry. He was a Private with regimental number 2207. At the time of his enlistment he resided in Holmbury St Mary. 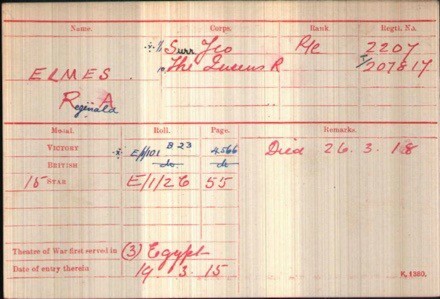 He served in Egypt where he disembarked on the 19th of March 1915 and later on the Western Front. At the time of his death he was part of the 10th Battalion, the Queen’s Royal West Surrey Regiment. He was a Lance Corporal with regimental number T/207817. 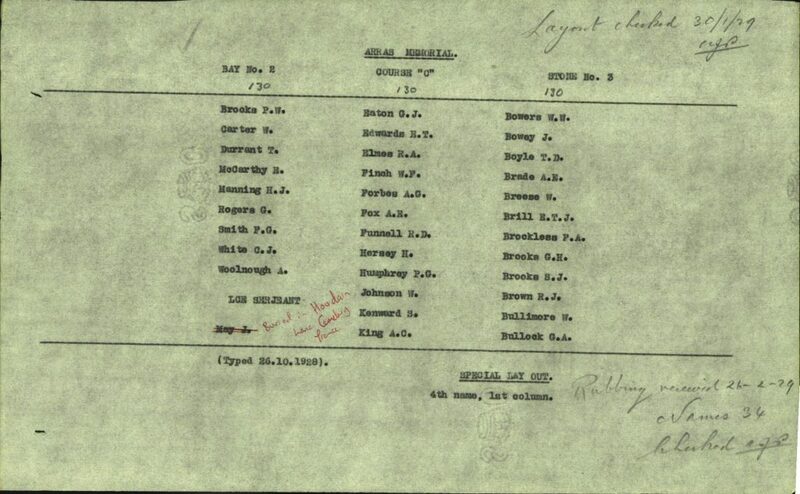 Reginald was killed in action between 22nd and 26th of March 1918 in France. He is commemorated on the Arras Memorial in France on Bay 2. Ann Elmes received £27, 10s and 1d on the 6th of August 1918 and a further £16 on the 20th of November 1919 in Soldier’s Effects. She also received £215, 15s and 1d in the Probate. She resided at Hillside, Holmbury St Mary.